Betsy West is a video journalist and filmmaker with three decades experience in news and documentaries. Most recently, she directed RBG (CNNFilms, Magnolia, Participant) along with CJS alum Julie Cohen ‘89. RBG, a theatrical documentary about Supreme Court Justice Ruth Bader Ginsburg, premiered at the Sundance Film Festival in January 2018 and will be released nationwide this May. West joined the Columbia faculty in 2009 after working three decades in network news. As a producer and executive at ABC News, she received 21 Emmy Awards and two duPont-Columbia Awards for her work on “Nightline” and “PrimeTimeLive” and the documentary program ”Turning Point,” where she served as executive producer from 1994-1998. As senior vice president at CBS News from 1998-2005, she oversaw “60 Minutes” and “48 Hours,” and was executive in charge of the CBS documentary 9/11, winner of the Primetime Emmy Award in 2002. 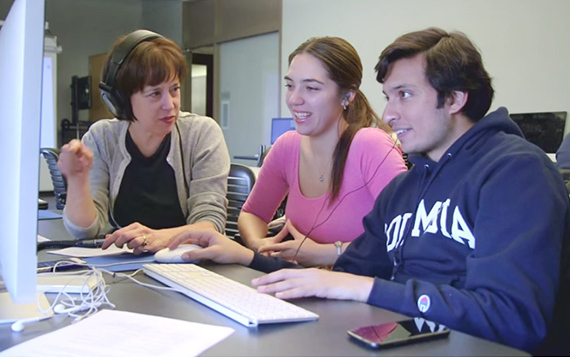 At Columbia, she teaches classes in reporting, video production and documentary. She co-curates and moderates the FilmFridays screening series that brings first-run documentaries and their directors to the Journalism School. A Phi Beta Kappa graduate of Brown University, West holds a Master’s in Communications from Syracuse University. She served two terms on the Corporation of Brown University, and sat on Board of Directors of The New 42nd Street. She and Oren live in Morningside Heights. This workshop is for students with shooting and editing experience who want to hone their storytelling skills, experiment with new styles and explore the expanding landscape of video. You will produce three short documentaries (3-10 minutes long) over the course of the semester culminating in a final project and public screening. This year, we will be including an extra, two-day After Effects training session to introduce you to the sophisticated graphics animation that is becoming a staple in the video world. Students in previous classes have produced assignments that have been posted on Slate, Channel Thirteen’s METRO FOCUS, Frontline, the Daily Beast, and in the J School’s 100th anniversary celebrations.